Rudraksh come in different mukhis or the clefts or furrows on the surface. Shastras speak of 1 to 38 mukhis but normally 1 to 14 mukhis are used for astrological benefits. Each bead has a different effect on you, depending on the number of mukhis it has. 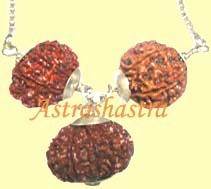 Each Rudraksh is very individualistic and has to be carefully matched with one's horoscope for it to be beneficial. The seed of Rudraksh has been given a very special place and it is credited with mystical and divine properties. The botanical name of the Rudraksh plant is 'ELAEOCARPUS GRANITRUS'. This is found in the various parts of the world. It is said that the seed of Rudraksh contains the secrets of entire evolution of the cosmos within it. The devotees of Shiva, observe forms of Shiva, Shiva-Parvati, Shivalinga etc. in Rudraksh. There are various stories regarding the origin of Rudraksh in various Puranas. Ancient vedic scriptures like Shiva Purana, PadmaPurana (Chap 57) Srimad Bagwata (Chap III to VII ) Rudraksh Jabbalaoapanishad, Mantra Maharnava, etc. mentioned about the greatness and wonderful properties of Rudraksh beads. 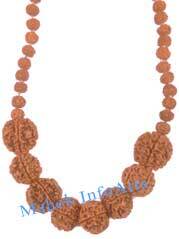 It is believed that one who wear Rudraksh on their bodies, cannot be affected by sins. Even if, one wears Rudraksh on his body, without doing worship and saying the sacred mantra, does no get near any sinful deed or thought.